Toasters have come a long way over the years, and the Dualit toaster range personifies how much has changed. While Dualit toasters may be on the high end of the spectrum in terms of price, their reputation for manufacturing high quality and durable toasters is rock solid and stands out in every Dualit toaster review. Each of these toasters has a certain heavy-duty and sturdy appearance that makes it look like an industrial and commercial-grade toaster. At the heart of every Dualit toaster is its patented ProHeat elements system. Essentially these elements are armor-plated filaments, and are designed to improve toasting efficiency and element longevity. As a result, you can expect any toast in Dualit toasters to be exceptionally even and the toaster itself should last that much longer too. Unlike most modern toasters, every Dualit toaster is manually operated with a rocker switch that allows you to select how many slices you’re toasting, and a timer knob so that you can decide how long you’d like it to toast for. 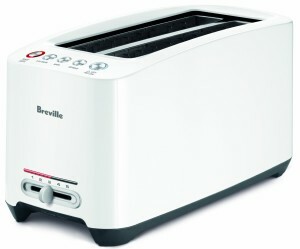 Also in contrast to conventional toasters the toast won’t ‘pop up’ automatically with a Dualit toaster, and needs to be manually raised – to ensure it is kept warm until ready. Present in every Dualit toaster is a removable crumb tray that will allow you to clean it easily, as well as an adjustable rear foot so that you can situate it on uneven surfaces. The manual ejector will let you check on bread while it is toasting, and comes with a high lift mechanism so that even smaller pieces of bread or muffins can be taken care of easily. If you’re interested, all you need to do is choose between the variants of the Dualit toaster – each of which is distinct in its own way. As its name suggests, the Dualit 2-slice toaster is designed to accommodate 2 slices of bread within its extra-wide 28 mm slots. It has a polished chrome exterior that gives it a very classy yet industrial look. Just as every Dualit toaster, it comes with the award-winning ProHeat elements that ensure the quality of its toast. Perfect for toasting on a small scale, this toaster is very much the ‘home’ variant of the Dualit range of toasters and yet it has all the hallmarks and capabilities of its larger siblings. On the whole the Dualit Classic 2-slice toaster is similar to the regular version and is differentiated by its more classic looks. Featuring a variety of different finishes that include lime green, citrus yellow, plum, charcoal, azure blue, canvas white, and even chili pink – these toasters have a decidedly retro feel to them. For anyone who wants a slightly flashier version of the Dualit, this toaster is definitely the right one. Needless to say it is just as capable as all other toasters carrying the Dualit name and the differences are really only skin deep. Aside from its finish, it has all the features of the regular version. If a toaster that is capable of handling higher demand is required – the Dualit 4-slice toaster should do the job nicely. Just like the Dualit Classic, it comes with a variety of different options in terms of color. As you can well imagine, this version of the Dualit toaster stands out by being able to accommodate 4 slices of toast in individual slots. Owing to its capacity, the rocker to select the number of slices is similarly altered so you can select whether to toast anything from 1 to 4 slices. Aside from that it is comparable to its smaller siblings in all other ways and has the same features too. Whether you’re looking for a 2 slice toaster, a flashier variant, or a 4 slice version instead – Dualit has you covered with the selection that they bring to the table. With each of these toasters you can be assured of the quality of toast that you’ll end up with, as well as the quality of the toaster itself. That is why pretty much every Dualit toaster review comes to the same conclusion: It is a case of ‘you get what you pay for’ – and in this case since you’re paying for the best, you will get the best and nothing but.